Paperback, 6.5 x 9 in. / 80 pgs / 40 color / 20 bw. Edited by Roy Strickland. 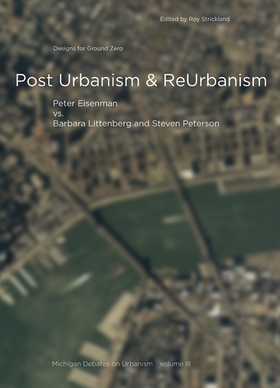 Essays by Peter Eisenman, Barbara Littenberg Steven Peterson. Foreword by George Baird. Introduction by Doug Kelbaugh. This volume is one of three books in The Michigan Debates on Urbanism, a series that also features Everyday Urbanism and New Urbanism. Each book represents a distinct, inevitable, but still-emerging paradigm in contemporary urbanism, and is an elaboration of public debates held at the University of Michigan's Taubman College of Architecture and Urban Planning during the winter of 2004. Peter Eisenman, acclaimed New York architect, author and theorist, presents several of his recent projects, including his team's entry for the controversial Ground Zero competition at the World Trade Center site in lower Manhattan. This project and the larger body of his work are termed Post Urbanist by the series editor Douglas Kelbaugh. 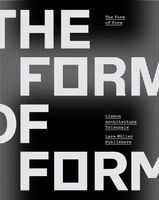 Post Urbanism refers to a critical, post-structuralist project, expressing avant-garde sensibilities and the techno-flow of a globalizing society. Barbara Littenberg and partner Steven Peterson, also well-known design practitioners from New York, present their entry into the Ground Zero competition, as well as other urban design projects that are characterized as ReUrbanism. Each side takes strong exception to the other's work, leading to a heated discussion moderated by Roy Strickland, Director of the Master of Urban Design program at Taubman College. FORMAT: Paperback, 6.5 x 9 in. / 80 pgs / 40 color / 20 b&w.